Whether you just finished a document scanning procedure and no longer need to keep the physical copies, or simply have built up a large volume of files that need to be disposed of, Record Nations has the solution. Local paper shredding companies are partnered with Record Nations from all across the country to bring you secure and convenient document destruction options to choose from. We provide you with free quotes in just minutes from local providers in your area. Give us a call at (866) 385-3706 for free quotes. Record Nations works with several types of document destruction companies that offer their customized services for any project size and schedule requirements. Use the service links below to learn more about each our service options. 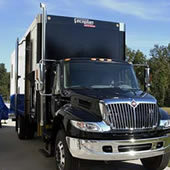 Mobile shredding brings the shredding directly to your location with an industrial shredder sent to your curbside in a secure, mobile truck. 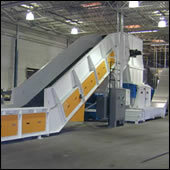 Your papers are shredded on-site while you watch, whether you are required by law or for personal reassurance. For high-volume shredding projects, the off-site shredding service is a fantastic option that is both secure and convenient. Lockable bins store your documents at your location until they are ready to be picked up and transported to an offsite shredding facility. All your papers are co-mingled and shredded, after which they are properly recycled. Partner up with Record Nations to host a community shredding event to promote your brand within the community, creating lasting relationships with future clients. Our Shredding Events specialist guides you through the entire process, making sure you have all the resources and information to make your shredding event a success. Record Nations works with local document shredding companies to bring you the best deals on secure shredding services. We offer free quotes from destruction services in your area that best meet your shredding needs. To get started, fill out the form on the right or give us a call at (866) 385-3706. We will contact you in just minutes with free quotes to choose from.